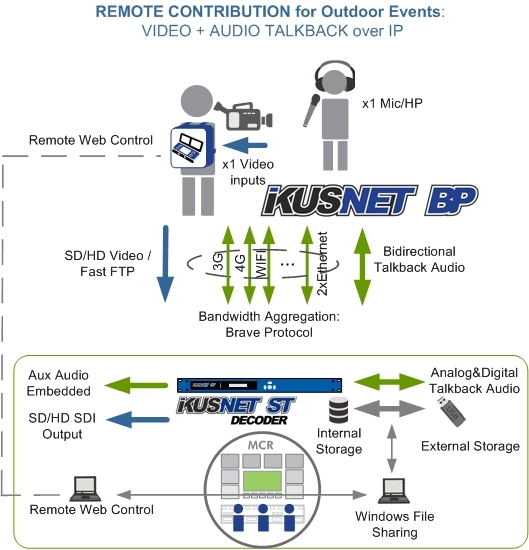 Ikusnet BP (BackPack) is a new robust, small and easy to carry unidirectional portable video encoder that is an ideal partner to the new Ikusnet ST Decoder. Bonding of up to 10 different IP interfaces (2xEthernet, 8x3G/4G, 1xWIFI) assures best possible network utilization, reduces delay and secures the connection against packet losses. Ikusnet BP has been designed to be easy to use and can be operated either from a detachable touch panel screen connected to the unit by means of a USB cable, or from the web interface. This touch panel allows the user to control and monitor the system whilst still carrying it in its backpack. Ikusnet BP can be entirely controlled and monitored remotely via the built-in web server. In addition to this, comprehensive definable presets allow the unit to be setup in advance, so that non-technical users can accomplish live broadcasts quickly and easily. Furthermore, a separate bidirectional IFB/Talkback audio channel allows the reporter to talk to the Studio. Unidirectional live video + bidirectional talkback audio streams. · Mpeg4 AVC/H.264 HD/SD Live video broadcasting over IP and Satellite. -Antenna Frecuencies: 698 to 960 MHz; 1710 to 2700 MHz. · Support multiple 3G/4G/Dual-Ethernet/WIFI link aggregation of up to 10 links. · Multiple transmission protocols: BRAVE™ (BitRate Adaptive Video Encoding), MPEG-TS and RTMP. · Compression and streaming of up to 4 SDI embedded audio channels. · FEC, Active Packet Recovery and Error Concealment to reduce the impact of packet losses. · Live Recording and fast FTP file upload via data link aggregation of up to 10 IP interfaces (3G/4G/Dual-Ethernet/WIFI). · NAT Traversal Remote control via web interface of Ikusnet BP from Ikusnet ST.
· Unique design with one detachable touchpanel and a extremely user-friendly interface. · Meant for Mobility:backpack, 12V feed or battery powered.